SUBSCRIPTION | Synconics Technologies Pvt. Ltd.
Automatic creation of clear contracts: Confirm a quotation with recurring products and the contract is created with the correct settings and products. Automatic customer invoicing: Speed up the invoicing process by automating it after easily setting up your customers’ data. Accounting is automatically up-to-date, including invoice creation, validation and payment encoding. Automatic tax handling: Taxes are managed automatically in real time based on your settings for regions and rates. Automatic payments: Ongoing payments are dealt with automatically. Easy signups: Send sales orders and contract management page directly to customers through secured URL access. No login required: No need to log in or even to create an account on your website to browse contracts and quotations. User-friendly customer portal: Give access to customers to all their data at a glance and in detail: running contracts; interactive quotes allowing customers to get in touch with the salesperson; orders; and invoices (pdf format). Customers editing option: Let customers modify contact details and fine-tune access rights to contract options as well. Display extra options customers can simply add or remove from the contract. Easy payment and customer invoicing: Let customers access automatic payments upon credit card registration and receive invoices by email automatically. 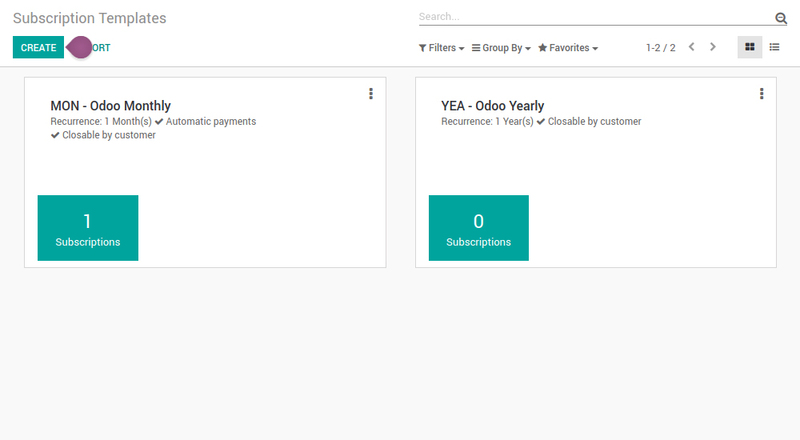 Clear overview: Let customers browse through all the details of their online contract: invoice address, recurrence, next invoice date, plan, options, payment. Contracts closable by customer: Customers can close the contract themselves and provide a reason for their decision. No data lost, ever: Information is safely stored, even when a payment doesn’t go through. Monthly Recurring Revenue: Speed up your sales team with contract templates for your most frequent sales scenarios. Customer Satisfaction: Let dissatisfied customers close contracts themselves and give you the reason for their decision or ask them to contact you first. KPI tracking: Net and Non-recurring revenue, Average revenue per contract, Annual run-rate, Lifetime value, Logo churn, Revenue churn and Contracts. Create templates: Save time by creating and use contract templates for your most frequent scenarios. Set up billing scenario: Supports price lists, discounts and units of measure. Manage customer access: Self-subscription & management from the customer portal (grant different access rights to your users: restricted, upgrade only, upgrade and downgrade), define service options and setup fees. Analyze per Salesperson: Examine each sales team member’s impact on your MRR for New, Churned, Expansion, Down and Net New MRR per Salesperson.